This Phillies history post is sponsored by Shibe Vintage Sports. Check them out for the latest throwback sports apparel! Here’s the unbelievable story of Arthur Irwin, manager of the Phillies from 1894-1895. He was quite a character. 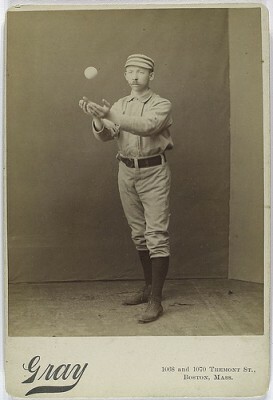 He is credited with adding fingers to the baseball glove when he was a player (he did so to protect two broken fingers), he was UPenn’s head baseball coach for many years, he was an innovator of the electric scoreboard, and as a pro manager he led one of the best squads in Phillies history, the mid-1890s squad led by Big Ed Delahanty and lefty catcher Jack Clements. After leaving the Phils, he continued to manage and scout for a number of minor league teams. But it is his death in July of 1921 that makes him worthy of further study. He had relinquished his position as scout for the Hartford club of the Eastern League a few weeks earlier due to abdominal trouble, caused by stomach cancer (Supposedly. The doctor who diagnosed him was never found). The former Phillie skipper was also suffering from “nervous attacks”. He decided to book passage on a ship, the Calvin Austin, to ride from New York to Boston. Once at sea, he told a fellow passenger on the steamer, “I am going home to die.” Irwin didn’t make it home. When the steamer pulled up in Boston, Irwin was not on board. As a newspaper reported the next day, “Irwin was with a party of friends aboard the steamer. Members of the party said today that he was depressed when he left them before midnight.” They never saw him again. His death was a compelling human interest story, but it was also a quite a mystery. Did he kill himself because he was so physically ill or because he was so devastated by what he had done? Was he murdered, as perhaps someone knew that he had just made $2,000 and were hoping to get their hands on it? Did he die at all, or was it all an elaborate ruse to get out of the hole he had dug for himself? You know, like Elvis. Questions and conspiracy theories abound, spurred on by the mysterious acts of his final days. Before he hopped on the ship, he sent a check to his “legal” wife Elizabeth in Boston for $500 and a note reading, “God Bless You All”. It was unusual in that he had almost never shipped money home or sent such cryptic notes. He had made $2,000 the day before he boarded the steamer, as he had sold the rights to an electric scoreboard he had helped to create. (You can read about Harvard “watching” the 1920 Rose Bowl on one such scoreboard here. I told you Irwin was an interesting dude.) But the check on the bill of sale was made out to “Seeler”, and no-one named Seeler was ever found. $500 of the sale went to Elizabeth, and the other $1,500 went to May in New York. So much for Elizabeth’s claim that he loved her more. Needless to say, if anyone reading this has any further information about this incredible story, we would love to hear it! This article was originally published by our friends at Philly Sports History.